(Irvine, California) October 2, 2017—Morinaga America, Inc. is making your candy selection a thriller this year with the launch of the new HI-CHEW Sweet & Sour Mystery Mix bag. Featuring four flavor varieties including fan-favorites Sour Grapefruit, Sour Lemon and Green Apple, the bag will also include a fourth Mysterious Flavor. HI-CHEW is challenging its fans to guess the flavor of the unknown chew for a chance to win the ultimate HI-CHEW Halloween Grand Prize. Voting will be open starting today, October 2, 2017 through October 13, 2017, when the flavor will be revealed. 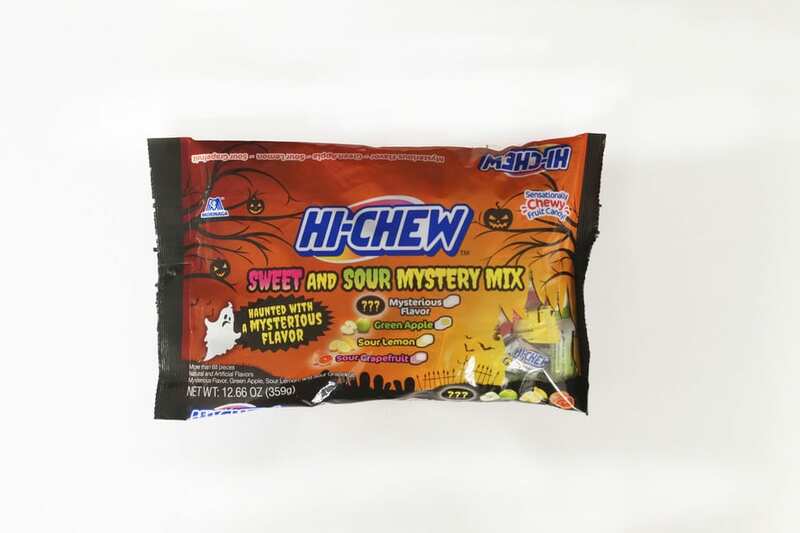 A Halloween story complete with hidden clues tied to the Mysterious Flavor will be featured on HI-CHEW’s social media channels, including Facebook, Twitter and Instagram. Fans will be prompted to submit their flavor guess on hi-chew.com. The Grand Prize includes HI-CHEW product ($100 value) and swag, along with a $100 gift card from Spirit Halloween. The product is available at select Walgreens, Target, and Albertsons as well as online at Target.com. To learn more about the contest and HI-CHEW’s new Sweet & Sour Mystery Mix bag, please go to www.hi-chew.com, like us at https://www.facebook.com/HiChew/, and follow us at https://www.instagram.com/hichewusa/ and https://twitter.com/hichew. The history of HI-CHEW stretches back over a century, when company founder Taichiro Morinaga brought candy-making skills to Japan from America in the 1800s. HI-CHEW has long been the #1 soft candy in Japan, and in recent years, has also become a hit in the rest of Asia and America, especially among the young. In the U.S., original HI-CHEW is offered in Strawberry, Green Apple, Mango, Grape, Banana, Cherry, Melon, and Kiwi. The HI-CHEW Sours come in Lemon, Lime and Grapefruit. HI-CHEW Bites are offered in Grape, Strawberry, Mango, and Orange and made with real fruit juice blended into the chewy candy, which is 100% free cholesterol or artificial colors.